Paris attacks suspect Salah Abdeslam has changed his mind and will not fight extradition from Belgium to France, his lawyer says. Abdeslam is one of the key suspects in November's Paris attacks which left 130 people dead. He was arrested and wounded in a police raid on Friday in Brussels. On Tuesday, suicide bombs in Brussels killed 31 people. The attacks are thought to be linked to the Paris attacks network and Abdeslam's arrest. So-called Islamic State (IS) has said it was behind both attacks. On Thursday, Belgium lowered its alert to the second-highest level. Abdeslam's lawyer, Sven Mary, told French media he "wishes to leave for France as quickly as possible" so he could "explain himself in France". Mr Mary had previously said Abdeslam, a 26-year-old French national born in Belgium, intended to fight extradition to France. The Belgian interior and justice ministers, Jan Jambon and Koen Geens, have offered to resign over the attack - but Prime Minister Charles Michel refused to accept their resignation. Mr Jambon admitted "errors" had been made after Turkey said on Wednesday that it had warned that one of the Brussels attackers, Brahim el-Bakraoui, was a foreign fighter, but that its warning had been "ignored" by Belgium. Abdeslam did not have prior knowledge of the Brussels bombings and had stopped co-operating with police following the attacks, Mr Mary said. A court hearing on Thursday on the detention of Abdeslam and two other suspects has been postponed until 7 April. Meanwhile, the director of the EU's police agency, Europol, has told the BBC the network of jihadists in Europe is "more extensive than perhaps we first feared". 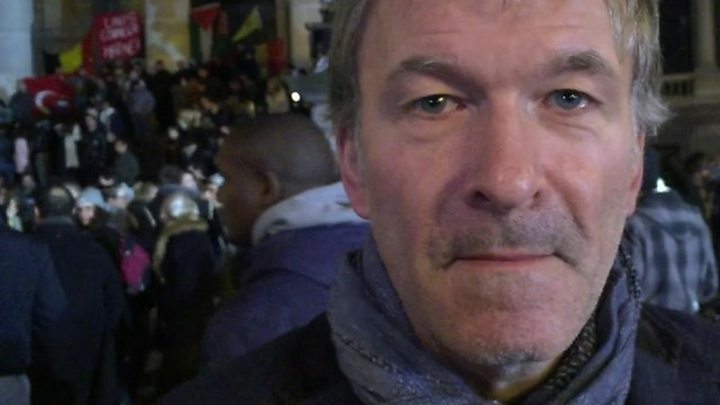 Robin Wainwright said there were concerns over "a community of 5,000 suspects that have been radicalised in Europe, that have travelled to Syria and Iraq for conflict experience, some of whom - not all - have since come back to Europe". Belgium's health minister has said that scores of people remain in intensive care following Tuesday's suicide bomb attacks in Brussels. Maggie de Block said that of about 300 wounded people, 63 were still in a critical condition. Brahim el-Bakraoui blew himself up in the attack at Zaventem airport that killed 11 people, while his brother Khalid struck at Maelbeek metro station, where 20 people died, prosecutors said. Unconfirmed reports say another of the airport attackers was the wanted jihadist Najim Laachraoui, whose DNA was found on explosives linked to last year's attacks in Paris. The third suspected airport attacker has not been identified yet and is on the run. Federal Prosecutor Frederic Van Leeuw said the third suspect, who was wearing a hat in CCTV footage from the airport, had left a bag containing "the biggest bomb", which later partially exploded after police had evacuated the terminal, injuring no-one. Meanwhile, police sources have told Belgian and French media that police are seeking a second suspect in the suicide attack on the metro. One source told AFP news agency that a man with a large bag had been seen beside Khalid el-Bakraoui on surveillance footage at Maelbeek metro station. The prosecutor has also confirmed an international arrest warrant was issued for Khalid in December after he was suspected of renting a house in Charleroi under a false identity from which the November attacks in Paris were carried out. EU interior and justice ministers held a crisis meeting in Brussels to discuss their response to the bombings. A minute's silence was held earlier at a makeshift shrine outside the Brussels bourse, attended by Belgium's King Philippe, the prime minister, other ministers and hundreds of people. Brussels Airport has tweeted that it would remain closed up to and including Sunday 27 March. Connections are emerging between the men who carried out the Brussels airport and metro bombings and the Islamist cell behind the Paris attacks last November, in which 130 people died.